Even if you're short on time during the holiday season, you can still get creative with your decorating. Try one of these easy, crafty Christmas projects to give your home a personal and festive feel. Making a table runner is a fast and easy way to add some holiday style to your dinner table. With a few simple supplies and a little time, you'll have a holiday table you'll be proud to show off. This project is so easy you'll be creating table decorations for every holiday! Measure your table to determine the length of the fabric. The table runner should hang off the table just slightly on either end. Add two inches to the desired length and width, and cut the fabric with your pinking shears. Use the iron to fold one inch of fabric under on all sides of the table runner. Apply the hemming tape to the edges, and use the iron to set the tape. Use additional hemming tape to decorate the table runner with ribbon, fringe, or other attractive trims. If you love beading and love the holidays, you probably already know that there are tons of great Christmas crafts using beads. You can easily make beaded icicle Christmas ornaments to trim your tree or attach to gifts. You'll be able to create endless variations using some basic supplies. Use the wire cutters to cut a piece of wire that is approximately eight inches long. With your pliers, form one end of the wire into a decorative hook or loop. Select beads and string them onto the wire from the other end. Allow about an inch and a half of wire to remain unbeaded. String a jingle bell onto the wire. Using the pliers, bring the wire up and wrap it around itself just above the jingle bell. Be sure to leave enough room for the bell to swing freely. If you'll be hosting a big holiday dinner or simply want to add a little Christmas style to your dining room, this easy centerpiece can't be beat. This is the perfect way to use up that leftover Christmas wrapping paper from last year. Wrap each box in Christmas gift wrap, or use patterned gift boxes to save even more time. Place a few spots of hot glue in the center of the largest package, and place the medium-sized package on top. Place glue in the center of the medium package, and stack the smallest package on top. Adjust the placement of the packages, and allow the glue to cool. Cut two lengths of the ribbon, making sure you have enough to go all the way up the stack of presents on both sides and have some leftover for tying. Place a dab of hot glue in the center of one ribbon, and lay the other ribbon on top to make a cross. Place another dab of hot glue in the middle of the top ribbon. 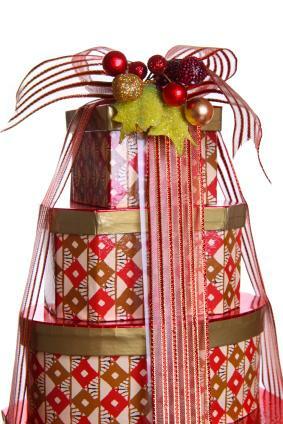 Put the stack of gifts in the center of the ribbons, and bring the ribbons up to tie on top of the stack. Make a bow and top with jingle bells or another decoration. Remember using raw potatoes to make stamps when you were a kid? Get ready to roll up your sleeves and try it again in this super-simple, grown-up version of that popular craft. These pillows will add a little bit of understated Christmas mystery to your couch; make at least two for maximum impact. Begin by cutting two 18-inch by 18-inch pieces of burlap fabric. Cut the raw potato in half, and carve away some of the potato flesh to create a deer footprint. Experiment with the stamp on paper until you're happy with it. Dip the potato stamp in paint, and stamp it across one of the burlap pieces at a diagonal. Allow the paint to dry. Placing the right sides of the burlap together, sandwich the piping around the edge of the pillow. Sew three of the sides, leaving a half-inch seam allowance. Insert the pillow form, and hand sew the remaining side closed. 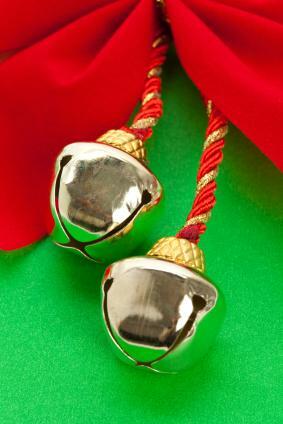 Nothing says holiday cheer like the sound of jingle bells. With this simple project you'll hear that happy sound every time you open your front door. Cut the velvet ribbon into four different-sized lengths: 16 inches, 18 inches, 24 inches, and 30 inches. Set the 16-inch piece aside. Hand sew or tie a jingle bell to each end of the three longer pieces of ribbon. Fold each of the longer ribbons in half evenly, and place the 16-inch piece in the middle. Tie all of the ribbons together in a knot. Make a loop with the 16-inch ribbon that will fit around the handle of your door. Tie the ribbon in a knot, allowing the ends to hang down. Use the glue gun to attach the three pinecones to cover the knot. Making your own holiday decorations is a great way to save money and personalize your home for Christmas. If you're looking for a cohesive and sophisticated decorating style, make your decorations in only one or two colors. For a more eclectic look don't limit yourself to red and green. Either way, your home will be beautiful for the holidays.